This was excerpted from The Galley's website: "...Opened in 1934, The Galley remains Santa Monica’s oldest restaurant & bar and a beautifully preserved California landmark. ... The Galley customers enjoy the best that Santa Monica has to offer from its oldest hidden treasure! The Galley will satisfy your every culinary desire while you dine in the warm, candle-lit ambiance and enjoy the entertaining charm of Captain Ron..."
How could one go wrong with an establishment that talked itself up like that? Plus, The Galley was within walking distance from The Marinater's opulent Santa Monica pad. Happy Meal and I tipped The Marinater's valet staff with an embarrassingly large sum, and we all wandered to The Galley. We were pleased to enjoy Happy Hour prices. This meant that the $13 burgers ($1 extra for cheese) were 1/2 off. We were promptly seated on the back patio, and we ordered 3 Galley Burgers with cheese. Our meals arrived in about 10 minutes. The Beef: Meh. The pre-formed, previously-frozen, 8-ounce, Chuck pucks were sourced from Avalon Meats. The beef tasted only mildly of....beef. There were no traces of aging, iron, other minerals, or any sort of flavors that would lead one to believe that they were eating a burger. The Galley Burger was also a little rubbery. This was to be expected, since the burger meat was previously frozen. The burger was neither juicy not greasy. The Seasoning: There was none. That was a shame...this burger patty was in dire need of seasoning. 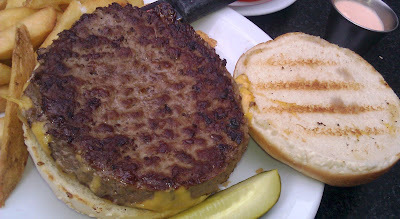 The Sear: The sear on the burger patties at The Galley was competent, but it added nothing to the burger. The bland, unseasoned beef was unimproved by the griddled sear. The Preparation: The burger patties were cooked on a properly hot flat-top. The burgers were mass produced in a factory far away. The patties were mechanically formed. This was evidenced by the densly packed texture and the uniform shape. While we all ordered Medium, the burgers came out Well-Done. In spite of that, they still failed to develop any substantial beefy flavors. The Cheese: This was a waste of $1. The thin slice of bland Tillamook Cheddar brought NOTHING to the party but extra calories. 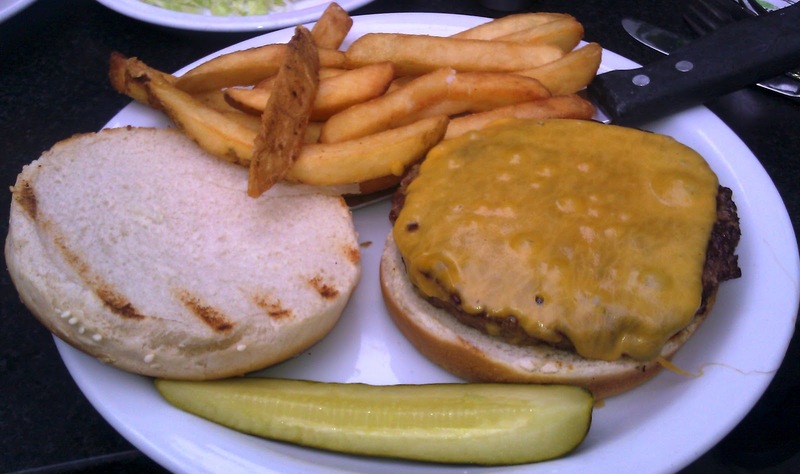 The Bun: The burger bun at The Galley was a standard, floppy, bland, barely toasted (grilled), seeded, burger bun. The bun was completely average and uninteresting. The Meat To Bun Ratio: This was fine, but it did not matter. The Fries: The peel-on steak fries were the highlight of the meal at The Galley. The fries were earthy, properly salted, and just crisp enough. The Toppings: The tomato slice was fresh and juicy. The shredded Iceberg lettuce was shredded Iceberg lettuce. The Value: The Marinater put it best when he quipped, "I don't see how they get away with charging 13 bucks." He was right. At half price the bland burger at The Galley was a weak value. At $13, I would have felt violated. While The Galley remained Santa Monica's oldest restaurant, it was certainly not a good choice as a burger spot. The Galley served up an over-priced, bland burger of average quality. Burger Review : Pass on The Galley Burger at The Galley in Santa Monica. It was not worth it. All that and it got 3 bites?